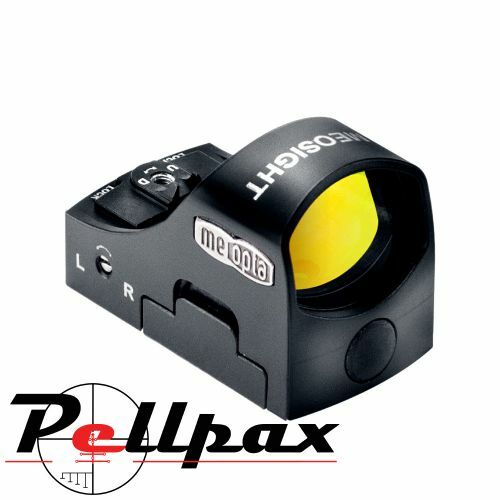 The MeoSight from Meopta is the latest in close quarters, quick moving situations target acquisition technology, and ensures that you are always on target the moment you need to be. The unit is small and compact and is parallax free thanks to its reflex design. Automatic and Manual brightness controls, as well as an auto off functionality allow the battery life to extend up to 1000 hours, and being just 35 grams, you'll barely notice it's there. The windage and elevation adjustments can be locked off so you know that when you squeeze that trigger each shot, you'll be on target. The durable weaver mount makes this a great accessory for shotguns, pistols, and other tactical weapons. Please Be Aware: There can be between a 1-4 week delay on Meopta products, dependant on stock availability. Add this item to your basket & spend an extra £160.01 to apply for finance.